How thin can a mobile display get? DC Motors: How Low Can They Go? Research often means coping with extreme conditions to retrieve the right data. Marine research is a case in point. Underwater sensors that descend to the depths of the world's ocean have to withstand not only temperature differences but also extreme pressures, yet still deliver reliable readings. Micromotors play a key part in the workings of a robust, compact system for precise depth control of underwater sensors at 2,000 m.
Engineers at prototyping specialist Protomold are often asked, "How can I get my parts made for less money?" If you can build in some flexibility in your design constraints, there are many ways to save. Protomold's Gus Breiland lays it all out for you. 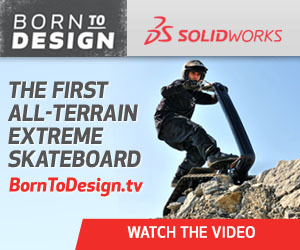 See what happens when engineers combine a skateboard with a tank. In an effort to improve sideline communications for football coaches, Shin-Etsu Silicones of America (SESA) recently collaborated on the development of an advanced-performance, "in-game" headset design. Instrumental to the ergonomic improvements of the new design was the integration of specially engineered materials from the advanced LIMS (Liquid Injection Molding System) silicone product line. Designing any exhaust system today is a challenge, considering the role the exhaust plays in emissions reduction and fuel efficiency. But, says Jesse Crosse, designing a system for a legendary sports car which not only satisfies noise regulations but also meets the emotional requirements of an iconic brand is tougher still. BlankWorks v5.0 provides SolidWorks 2013 users with a fully integrated add-in application for developing optimal flat patterns from complex 3D designs. BlankWorks is most commonly used for flattening complex 3D sheet metal components, but it has also been used for flattening a wide variety of other SolidWorks designs ranging from canvas tents, boat hulls, and aircraft and helicopter parts to insulation and thermoform packaging. New features include feature line mapping, which allows users to map lines and edges from part to flat pattern or curved surface -- extremely important for precisely locating manufacturing details such as surface edges, holes, bend lines, or paint lines on the 2D blank prior to stamping. NASA's Marshall Space Flight Center in Huntsville, AL, is using a method called selective laser melting, or SLM, to create intricate metal parts for America's next heavy-lift rocket. Using this state-of-the-art technique will benefit the agency by saving millions in manufacturing costs. Available in 2-way or 3-way, normally closed or fully ported, Clippard's Analytical Series electronic valves are designed for the specific needs of the analytical industry, and for applications where cleanliness is especially important. 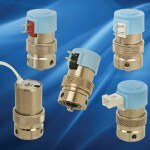 The "A-E" Series pneumatic valves utilize a unique patented valve system that has been used and proven throughout many industries. With a low power consumption of only 0.67 W; a response time of 5 to 10 msec; and voltages of 6, 12, or 24 VDC, these new valves offer unlimited flexibility in design with quick response and long life. Rolled and precision ball screws are key components in the design and assembly of linear actuators and other linear motion machinery used for transfer and positioning. MISUMI Ball Screw Support Units, available in standard, economy, and radial bearing types, incorporate pre-loaded bearings to provide steady rotation performance with high rigidity and accuracy. The screws are available in a range of types and shaft diameters, with lengths configurable in 1-mm increments. The ball screw support units, which anchor and control the screw at each end, are strong, rigid, and precisely engineered and sized. Carbon steel construction offers strength and durability, and finishing options include black oxide, nickel plating, or low-temp black chrome plating. 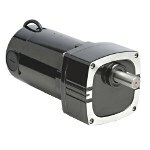 Bodine Electric Co. has launched a new generation of their type E and F gearmotors. The new 42A5-FX is a completely redesigned permanent magnet DC (PMDC) parallel shaft gearmotor that provides up to 40 percent more torque than previous E/F models. 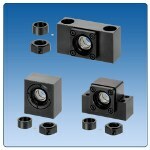 Forty stock models are offered with either 12/24 VDC or 90/130 VDC rated motor windings. A new synthetic lubricant allows the FX gearhead to operate at a wider temp range, while at the same time improving overall gearhead performance. Stronger, hardened helical steel gears and new needle bearings provide more torque and 25 percent longer product life. Engineers at the U.S. Army Space and Missile Defense Command/Army Forces Strategic Command are testing super-cheap 3D printer designs to see if they can develop their own on-the-go components and component creators. Truck design is about much more than just color, shape, and attractive lines. Behind the new, safer, larger, and more ergonomically optimized Volvo FH lies a significant design challenge. Take an inside look at the design of this new hauler. High-power (HP) LEDs can offer advantages in terms of lighting performance, energy efficiency, durability, and cost savings, but they are not always your best choice for every lighting technology application. Dwight Turner of Lumex and Cliff Ortmeyer from Newark element14 tell you why. Danish motion control innovators at PCBMotor put piezo ceramics to impressive use in this excellent introduction to their system of building one or more motors directly onto a PCB. This on-board innovation significantly reduces costs and introduces a host of new design possibilities while using standardized components and well-established assembly techniques. There are numerous applications that can use this technology, including laser and optics, camera, medical, telecom, aviation/aerospace, robotics, and instrumentation. Not much thinner than the 1-mm-thick units shown off by Japan Display at a trade show late last year. 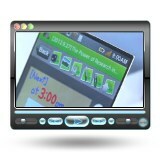 See the future of lightweight communication, where your primary mobile device is just bigger than a credit card.